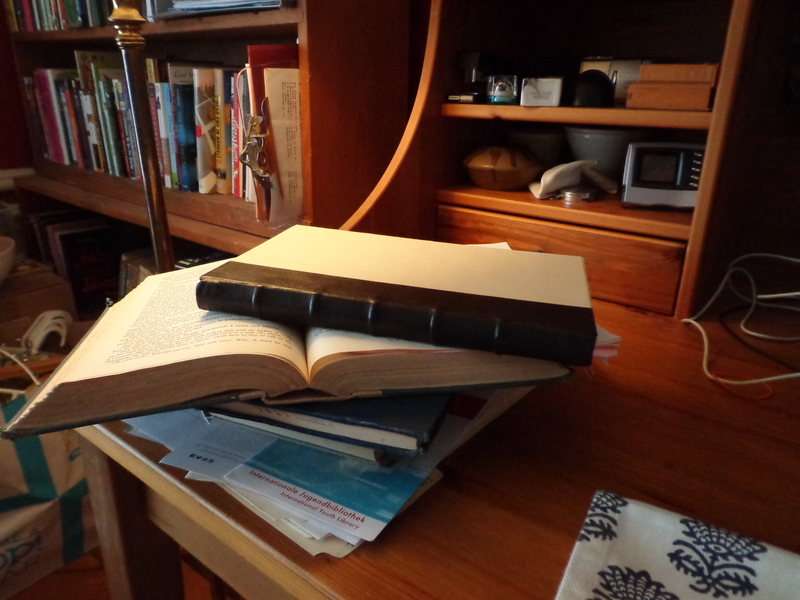 To see the other side of how books are made, in Fall 2015 I started taking classes at NYC’s Center for Book Arts. 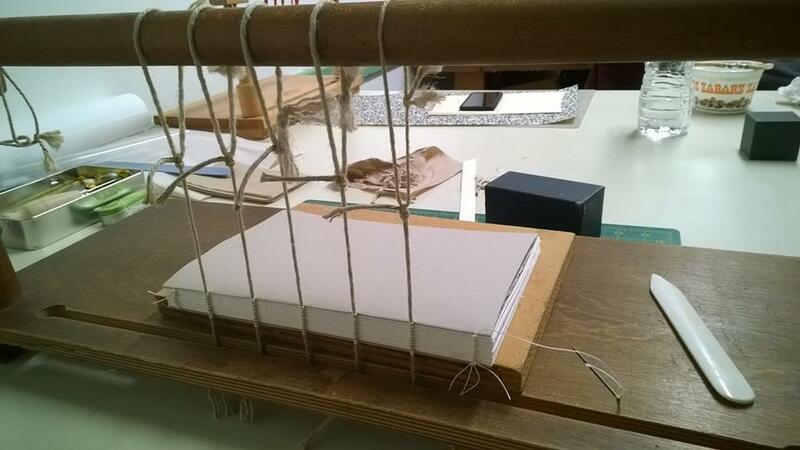 So far, I’ve done courses and workshops on bookbinding, letterpress, pop-up and tunnel books. Here are photos of some of my projects. The contraption on the left is a sewing frame, for guaranteeing consistent bindings across books in a fancy edition. Under the slot are “keys” that hold the cord taught as I sew it to the spine. The gray page on top of the signatures (there’s another at the bottom) is waste paper to protect the end paper — it’ll be removed when the binding is finished. And here’s the nearly finished product, leather-bound but not yet covered. What I can’t show is the time and effort to get all the fiddly bits in the right place — sewing the signatures so that the edges are even (these can be trimmed after sewing, but that’s a bit like cheating), getting the bands at the proper tension (neither too tight nor too loose), hiding where the bands connect to the boards, trimming and thinning (“paring”) the leather edges, trimming all the fillers to match the board edges perfectly, and then placing them just right to create a smooth surface for the cover. Here are the books I bound. 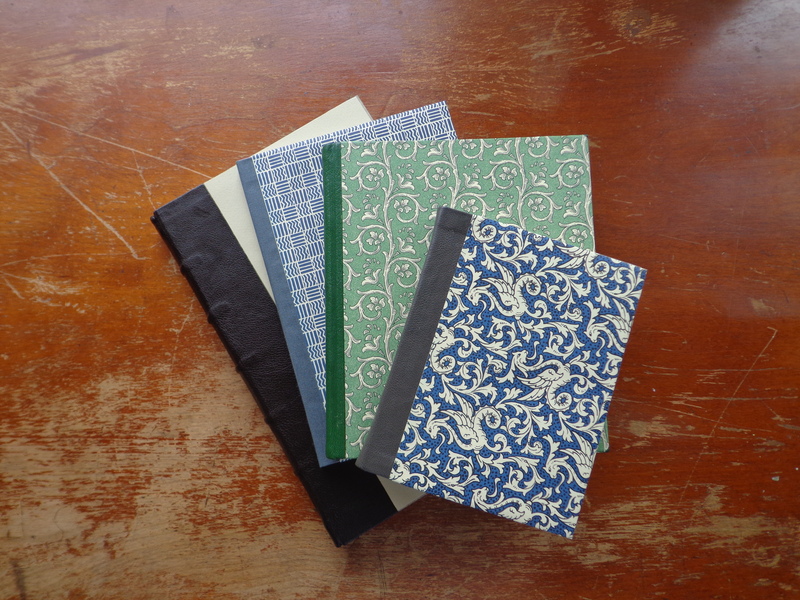 The second from the bottom, with a cloth binding, was my first attempt; the other three are leather bound. I prefer cloth, as there’s no prep required. Just measure, cut, and glue. Now I can sneer at badly made books with at least a bit of knowledge and experience. Unsewn signatures? I scoff. Outer spine glued to book block spine? I grimace. Machine-made headband? I feel so superior.